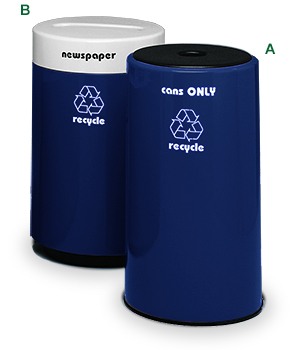 Perfect for areas in need of individual or group placement of recycling containers. Seamless, molded construction, with multiple thermosetting resin additives and Gel-Coat finish will not stain or tarnish and has a UV Stabilizer to resist fading. These recycling singles are available in an array of colors to match your area's décor. Labeling decals for these fiberglass recycling containers are factory applied and come in your choice of color Black or White.